I am already used 5 years,now 80000 running,now engine is good condition,good mileage,zero maintenance. Share your experiences with Ray Z? request for improving its mileage, rest all excellent. The best scooter for all occasion. Comfort, maintenance and style. First it was girls who were the target of Yamaha's fancies to sell scooters to, now it's the boys. So does the Ray Z have what it takes to live up to its feminine counterpart? 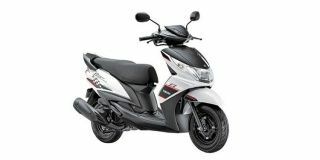 Confused about Yamaha Ray Z?